Best of the Week: 'Affordable' LG 4K OLED, Grado's first wireless headphones, HDR coming to Sky Q and more | What Hi-Fi? A round-up of the week's highlights, including Virgin Media's travails and the BBC's latest 'green button' innovation. This week, Sky revealed that it's finally bringing HDR to its Q TV service, Chord Electronics unveiled its Hugo M Scaler and Grado teased what's likely to be its first pair of wireless headphones. 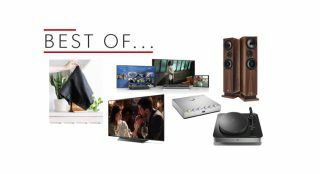 On the reviews front there's ProAc's Response DT8 floorstander, Elac's Miracord 70 turntable and LG's OLED55B8PLA 4K TV. Sky is planning a number of updates for its Q TV service and one new feature is the inclusion of HDR. Originally thought to arrive this summer, Sky has instead scheduled it for 2019. Sky hasn't yet confirmed which forms of HDR will be supported. As well as HDR, Sky plans to introduce voice-control to the service, as well as double the amount of 4K content that's currently available. Grado is well known for its wired headphones, but hasn't breached the world of wireless or noise-cancelling cans. That may soon change. The US brand has teased a pair of headphones on both Twitter and Facebook and of specific note are the words " Wait, where are the wires?" You can't see the headphones, but we expect all will be revealed soon, perhaps even at the IFA show in Berlin. Chord Electronics took the opportunity at the recent CanJam show to unveil its Hugo M Scaler. It's capable of upscaling 44.1kHz digital audio all the way up to 705.6kHz before it's passed off to a suitable DAC. It uses the same technology as the Blu MkII, which we liked very much. It's available in the autumn for £3495. "Slightly odd appearance aside, they deliver such an entertaining sound we can’t help but recommend them"
These floorstanders from ProAc may not be perfect, but then again very few things are. They boast an agile and articulate sound, with expressive dynamics and an insightful midrange. With fine build and finish, despite the proliferation of a few too many badges, they're great performers. These are among the best floorstanders we've heard at the price. "we find the OLED55B8PLA one of the most pound-for-pound impressive TVs we’ve seen this year"
This OLED is the most affordable one we've seen this year, but does it keep up LG's excellent run of form? In short? Very much so. The picture offers natural tones, and a rich and refined performance. The user experience is fantastic and the support, especially for variants of HDR, is excellent. More expensive 2018 OLEDs from LG have a slightly better picture, but otherwise this is one of the best-value TVs we've seen so far. "the Miracord 70 does enough to warrant consideration"
Elac's Miracord 70 turntable is a premium offering and a rather good one at that. It delivers a clear, spacious and articulate sound, though it could do with more weight. Despite that, the installation is refreshingly simple and it looks well finished. It's not quite up there with the best at its price, but its performance certainly merits a look.